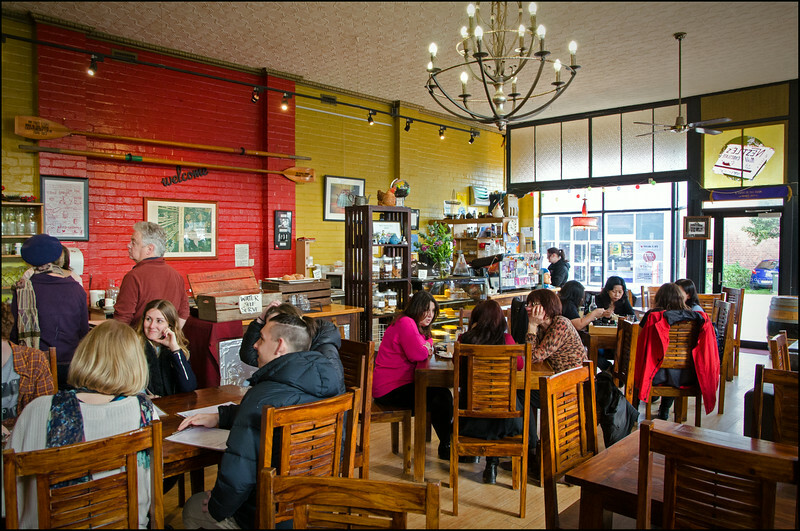 Edit: As of 2016, the Red Velvet Lounge is under new ownership and offers a completely vegan and vegetarian menu showcasing Huon Valley produce. We had only returned from South Korea days earlier. Meanwhile Monday, and the inevitable return to work, beckoned with a pallid and unappealing finger. What better way to fill this situational sandwich than to spend the weekend indulging in some of Tasmania’s finest food and scenery down the Huon Valley and Tinderbox Peninsula?! 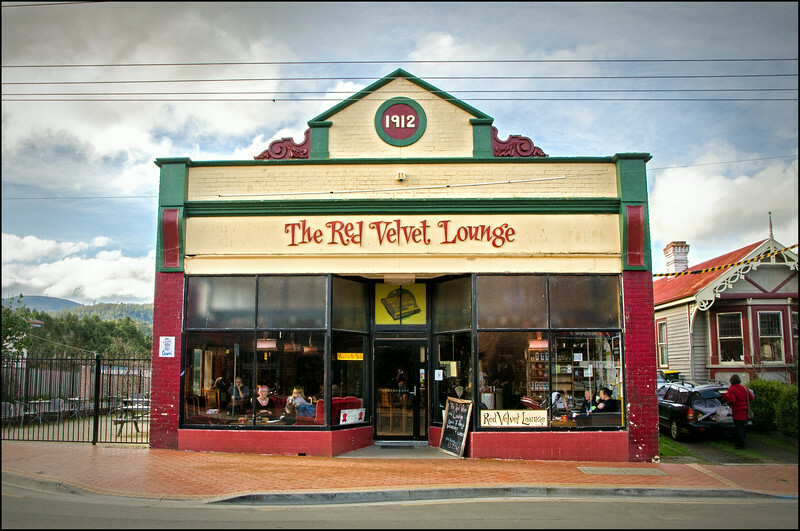 First up was an old favourite, Red Velvet Lounge. Normally it would be with the food, but in this case I feel it’s more appropriate that we take a peek at the man behind the velvet, Steve Cumper. It’s a shame he wasn’t in on the particular that we stopped by, as I would have loved to have said g’day. Perhaps five years ago when we first paid Red Velvet a visit, I’d never heard of the bloke. Three years ago when we again enjoyed dinner at Red Velvet, I had still never heard of the bloke. But somewhere between then, and now, I got a little bit more serious about my food and Steve’s name entered my consciousness. I can actually thank ‘Rita‘ for first putting me onto the trail. A random facebook comment was the culprit, with an offhand comment to a chap with a funny surname regarding his blog. Being the inquisitive internet stalker that I am, I did a little digging and was amazed to stumble across what I believe is one of the finest blogs in Australia. Simply titled ‘The view from my porch‘, you won’t find a more honest, intelligent and well written perspective on not just the food industry, but life in general. Now you’d think this was a good thing wouldn’t you? Well, I thought I knew myself quite well, but after reading the first article I actually felt quite despondent…this guy was a writer in the truest sense of the word, and I was clearly a pretender. I eat, I shoot, I write…but always from the same side of the table. What do I really know about the chef’s reality? Steve’s professional career in the industry is extensive and comprehensive. From a young lad subject to the kitchen initiations of a different time and place, to European Michelin stars, to working with some of Australia’s most beloved chef’s, Steve’s penmanship speaks of clear vision, years of experience, both worldly and from behind the hotplate, but most of all, a unique ability to craft and communicate a story. Whatever the message, if indeed there is a message at all, it’s effectiveness is only as good as the orator, and in Steve we have a communicator of the highest order. I haven’t met the chap, I haven’t spoken with his team, and so it would be drawing a very long bow to state categorically that it is his ability to communicate that has consistently delivered us such good food at Red Velvet, but surely it must be an influence? The lunchtime service was without flaw. Friendly from the moment we stepped out of the wan winter sun, timely, yet not overbearing. Having heard such good reviews, I nearly went for the corned beef with hot mustard sauce (more for the sauce than the beef! 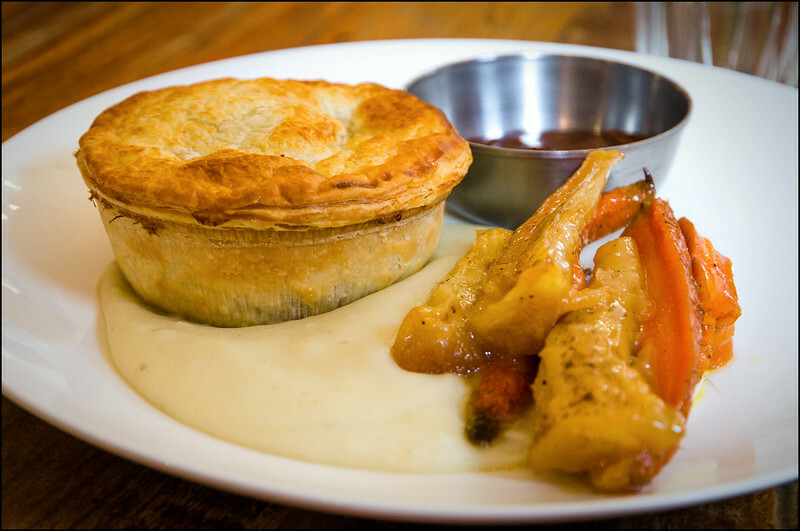 ), but instead tried the lamb pie with tomato chutney ($27.90), while Karen went with the hot-smoked salmon blinis with horseradish cream ($17.90). My lamb pie was the perfect antidote to a brisk winter’s day! Delicate morsels of lamb leg infused with the wonderful gelatinous flavours that can only come from slow cooking, sweet vegetables and one of the most well rounded, yet punchy chutney’s I’ve eaten in a long time! While the potato puree was tasty, it had been a tad overworked, which was unfortunate considering how incredible the rest of the meal had been. Didn’t stop me cleaning it up though! Regarding the salmon blinis, beyond the odd murmuring of immense satisfaction there wasn’t a single peep out of Karen. I tried a mouthful (that’s all I could negotiate!) and it was wonderful! 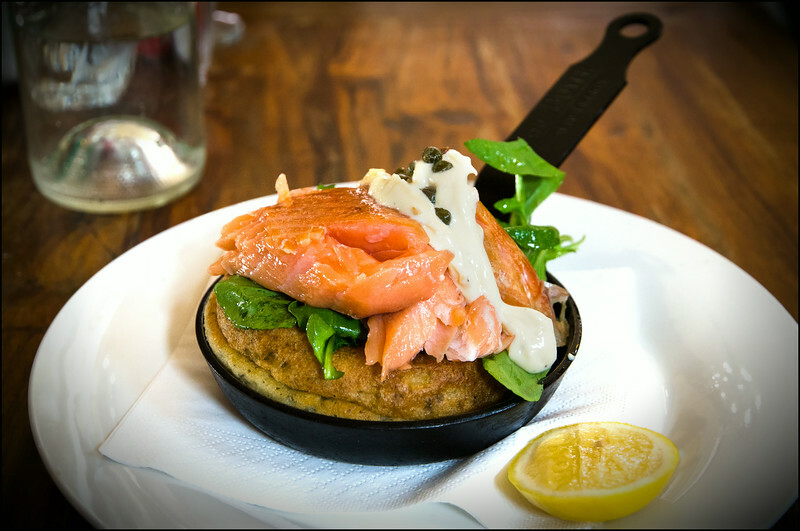 Deceptively light blini, quality Tasmanian salmon and a smooth horseradish sauce. The perfect start to our day in the Huon! 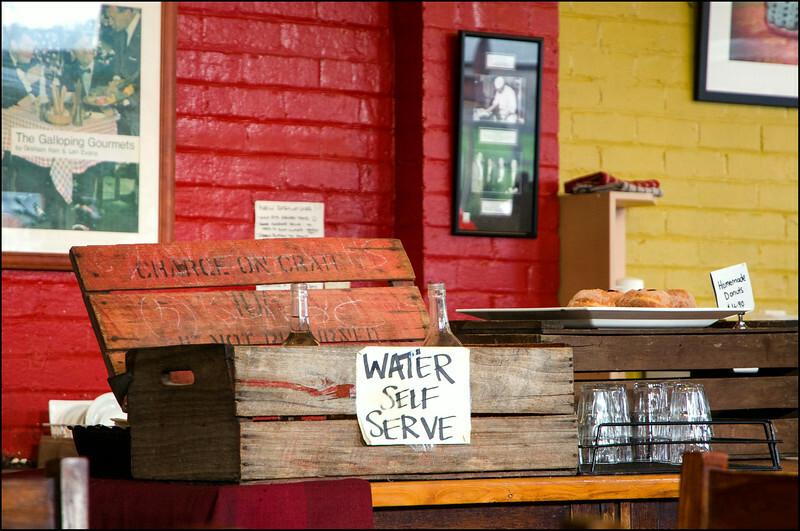 I would have loved to have tried one of their homemade donuts, as they looked so, so good, but by necessity I had to keep in mind that we still had another couple of venues to visit later in the day! What can I say? He’s ticked every single box that he set out to achieve, and then some! You can find the Red Velvet Lounge website here, (click on ‘More’ to view their menu), or you can drop by Steve’s blog here. Hi Andrew, sorry i missed you + i’m happy your rvl visit was a good one. My team are a great bunch, i’m very lucky. Wow, what a great endorsement of my writing, I’m humbled. Thankyou for reading! Thanks Steve. Credit where its due!